Not yet got a regify account? Price Free, for consumers only Price differs amongst regify providers dependent on the service level. Sign up for free! Request information now! Traditional e-mail has the confidentiality level of a postcard. Any actor involved in its transport can easily read it. 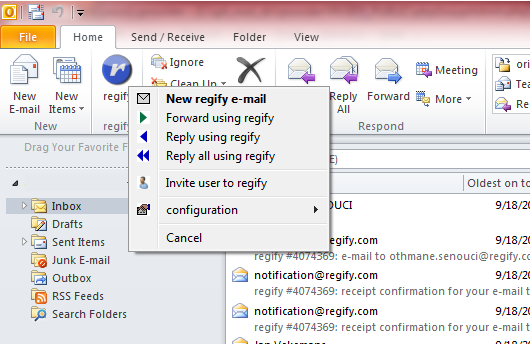 regimail offers a way to transform your e-mail into a confidential and auditable electronic letter. This works using your existing e-mail address and does neither allows regify nor any third party to access or to store the content of your e-mail. After registering with a regify provider of your choice you can read and write regify e-mails on the web portal of your regify provider (no software download necessary) or you can use the easy-to-install regify client software. The software is available as an add-In for Windows (Microsoft Outlook, Lotus Notes, Thunderbird), as a standalone version for Windows, MacOS and Linux as well as an App for iPhone/iPad and Android devices. These options ensure that you can use regimail as you prefer. 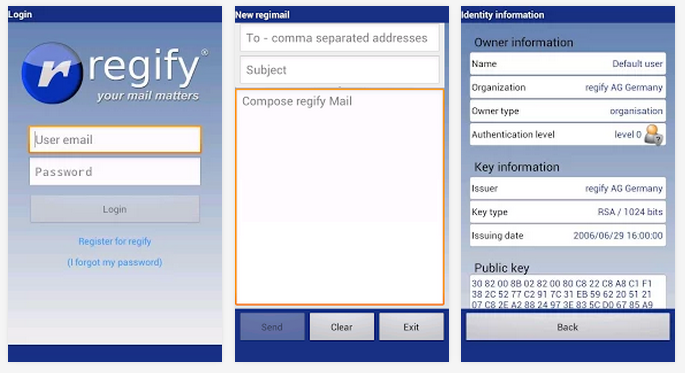 The regify technology encrypts your e-mail (message text, attachments) and compresses it before it sending it via your and the addressee’s e-mail providers as an ordinary e-mail with an attachment. This attachment is a regify file with the encrypted contents of your original e-mail. The respective encryption key is transmitted secured and encrypted to the regify data clearing service via your regify provider. In alignment with the regify data clearing service, the regify provider of the addressee of your regify e-mail ensures that the recipient is the right person and will transfer the key. As a result, the recipient can open the regify file and is able to display or store its contents. This is as simple as, for example, opening a pdf file with Acrobat Reader. When the key is delivered and the regify file opened, the recipient’s regify provider will notify the regify data clearing service. The regify data clearing service will notify your regify provider who in return, via e-mai,l will notify you about delivery of the regify file. Confirmation of receipt is recorded independently of the notification e-mail. The regimail service protects messages from unauthorized access and renders e-mails trusted and binding thereby providing security and trust in business communication. For the sender of a binding regify e-mail, the sending process is as straightforward as is the receiving process for the addressee of such personal e-mail. Of course, neither the sender nor the recipient have to change anything with their existing e-mail service. "When it came to selecting a service for sending electronic bills, compliance with legal requirements and ease of use were particular important to us. It is a great relief for us that we merely need to enter the e-mail address of the bill recipient to change over to digital sending." 1) No dedicated app on Google Play or iTunes (as of 11/2018). Possibly integrated in WEB.DE or GMX Apps? Login at free.regify.com Sign up for free! Please be aware, you can register your e-mail addresses only once for our service!